LumberJack Mod for Minecraft is a simple mod that allows you to cut down entire trees by breaking only a single block! It is lightweight, requiring no APIs and modifying only a single class! LumberJack is also highly configurable through a settings file! Many aspects (with more to come!) of the mod can be completely customized through a simple properties-format config file! And it’s open source! Key binding to boost the cutting range by a configurable amount. Useful for clearing jungles! Default V.
Key binding to disable breaking multiple logs. Default left-shift. Ability to define custom axes. If you have a mod that adds a new type of axe, you can make LumberJack recognize it! Forge version that does not mod the jar! break_vines: True/False. 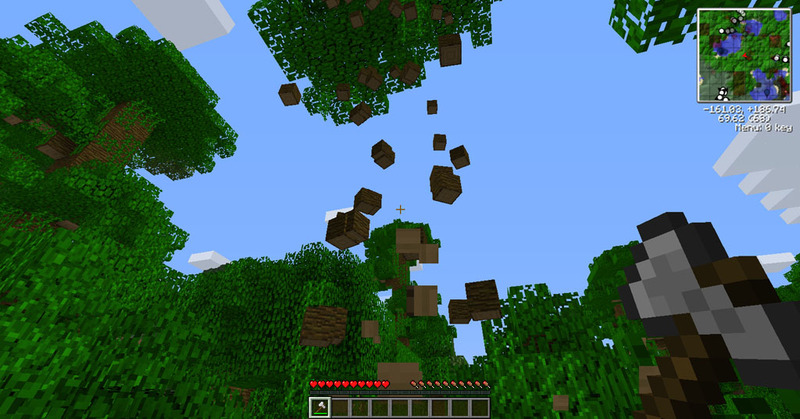 Toggles breaking logs automatically breaking attached vines. Currently broken and does nothing. break_blocks_down: True/False. Toggles breaking wood blocks below the first one broken. Set to false to leave stumps if trees are cut in the middle. tree_cutting_radius: Integer. The maximum distance wood blocks can be to be considered adjacent. Not recommended above 5 or serious lag can be caused. custom_axe_ids: Integers separated by commas. Item IDs to be treated as axes. If you have a mod that adds new axe types, then add the Item IDs here to make LumberJack recognize them. do_deplete_tool: True/False. Toggles the axe being damaged by every block broken. block_break_radius_boost: Integer. Sets the “boost” amount given by holding down the key set in break_boost_key. break_boost_key: String. Assigns the key for the break radius boost. break_disable_key: String. Assigns the key returning to vanilla log breaking.